“Racial Disparities in the U.S. 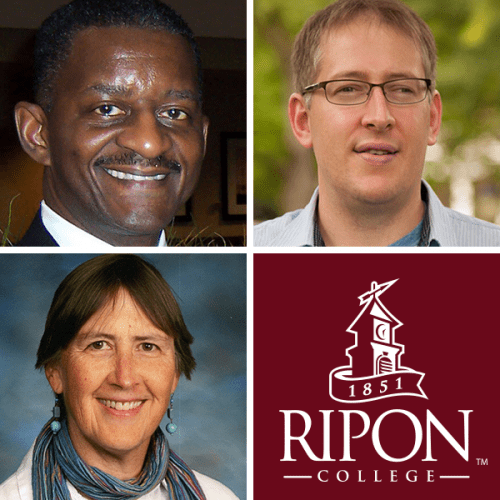 Judicial System,” a panel discussion, will be presented April 25 on the Ripon College campus. The presentation will begin at 4:30 p.m. in Kresge Little Theater, East Hall. It is free and open to the public. Significant racial disparities can be found in all aspects of the American criminal justice system, including policing, pretrial, sentencing, parole and post-prison stages. The U.S. criminal justice system is a world leader in its rate of incarceration, with a particularly disproportionate impact on communities of color. The panel members will explore some of the background and implications of these circumstances. Kat Griffith, a teacher of Spanish, reading and social studies at Ripon High School and Lumen Charter High School. She is active in the Comprehensive County-wide Diversity Initiative of Fond du Lac County and has led several seminars on race and immigration in the United States. In addition, she wrote a chapter in the book White Women Getting Real About Race. Marc Eaton, associate professor of sociology and chair of the Department of Sociology and Anthropology at Ripon College, is an adviser for Ripon College’s minor in criminal justice and has worked with many students pursuing careers in criminal justice. Carl Ashley is a judge for Milwaukee County Circuit Court, Branch 33. In 1999, he was the first African-American judge to be elected directly by voters in the state without receiving a gubernatorial appointment. The moderator will be Steve Sorenson, adjunct professor of politics and government and pre-law adviser at Ripon College. The event is sponsored by Amnesty International, the Pre-Law Society and the Center for Politics and the People. Posted April 15, 2019 in Political Publications, Social Responsibility, Special Event by Jaye Alderson.